The eight people currently on death row in the north-western state immediately had their sentences commuted to life. A total of 23 people were executed in the US last year, but Washington has not carried out the death penalty since 2010. Judges sitting on the Washington state Supreme Court unanimously backed Thursday's decision, made during an appeal by death row inmate Allen Eugene Gregory, who raped and murdered a woman in 1996. The appeal had included a study which showed black convicts were 4.5 times more likely to be sentenced to death in Washington state than white inmates. The ruling said the death penalty "fails to serve any legitimate penological goal" in Washington. Furthermore, it is "invalid because it is imposed in an arbitrary and racially biased manner". "We know that zip code and race are likely determinants of whether an accused criminal is sentenced to death," he added. "There has been nothing equal, or fair, or just, about that." 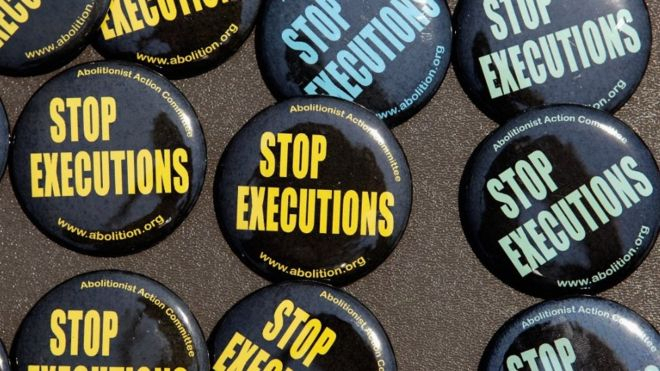 Kristina Roth, of Amnesty International USA, said in a statement it was "tremendous news for all who fought to abolish the death penalty in Washington". "Now that Washington has become the 20th state to end the ultimate cruel, inhuman, and degrading punishment, other states should follow suit," she added. "The court ruled that the death penalty is imposed in an arbitrary and racially biased manner and is invalid. The death penalty is the ultimate denial of human rights, it does not deter crime or improve public safety, and it should be ended once and for all." Advocates for capital punishment argue it should be available for those who commit the worst crimes.